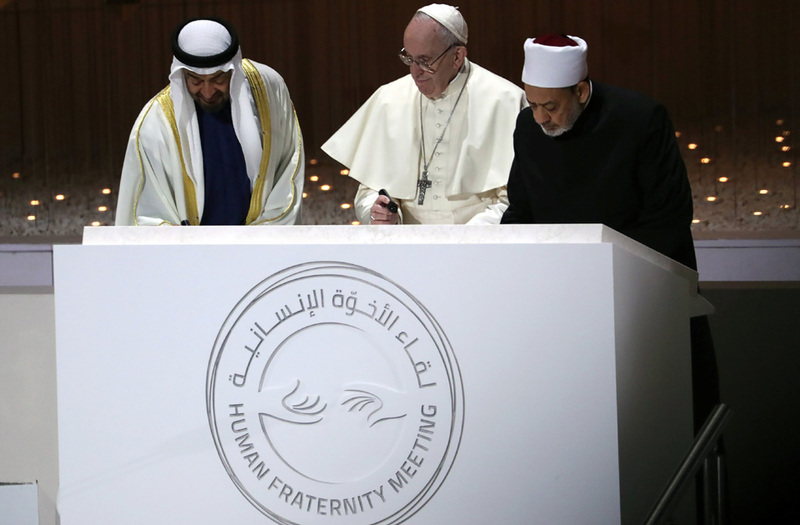 Pope Francis, Abu Dhabi's Crown Prince Mohammed bin Zayed Al-Nahyan and Grand Imam of al-Azhar Sheikh Ahmed al-Tayeb sign a document during an inter-religious meeting at the Founder's Memorial in Abu Dhabi, United Arab Emirates, February 4, 2019. 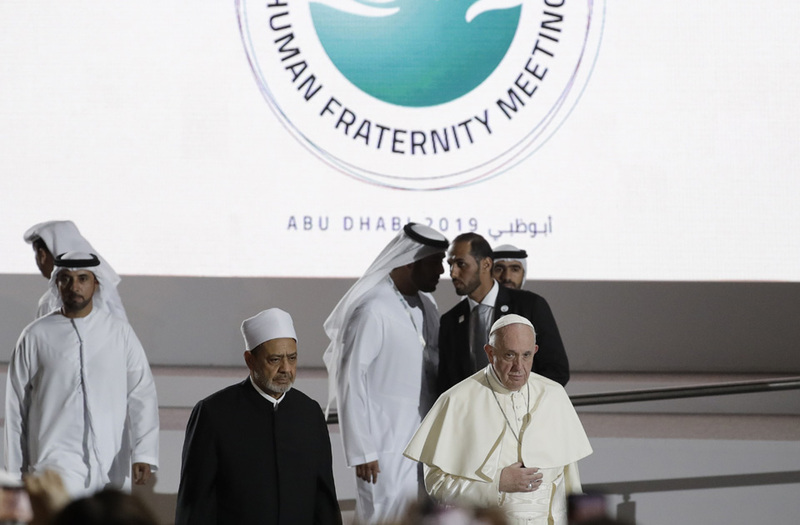 Pope Francis is flanked by Sheikh Ahmed el-Tayeb, the grand imam of Egypt's Al-Azhar as they arrive for an Interreligious meeting at the Founder's Memorial in Abu Dhabi, United Arab Emirates, Monday, Feb. 4, 2019. 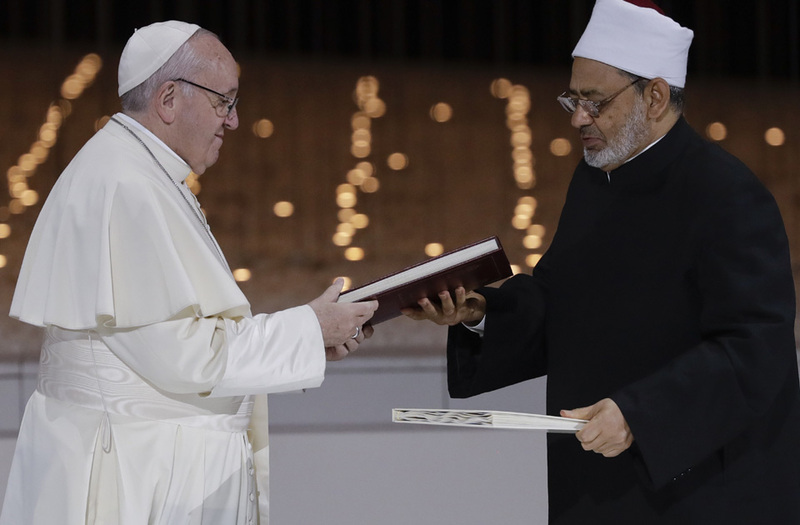 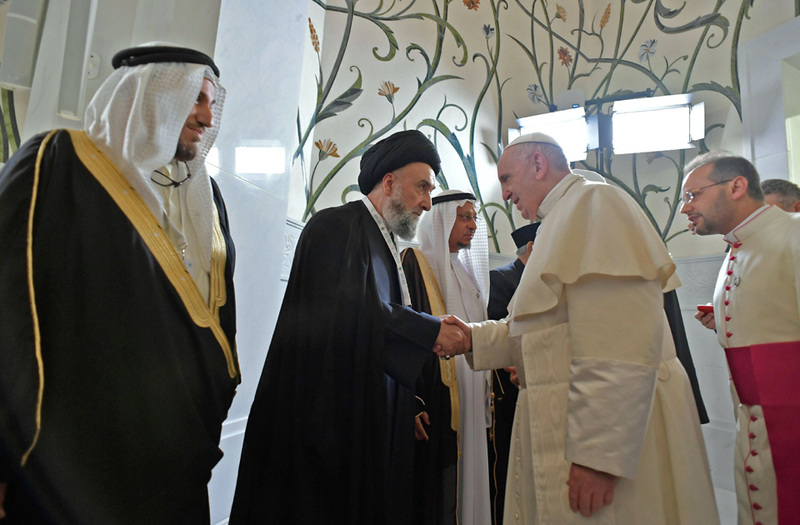 Pope Francis, left, and Sheikh Ahmed el-Tayeb, the grand imam of Egypt's Al-Azhar, exchange a joint statement on "human fraternity" after an interfaith meeting at the Founder's Memorial in Abu Dhabi, United Arab Emirates, Monday, Feb. 4, 2019. 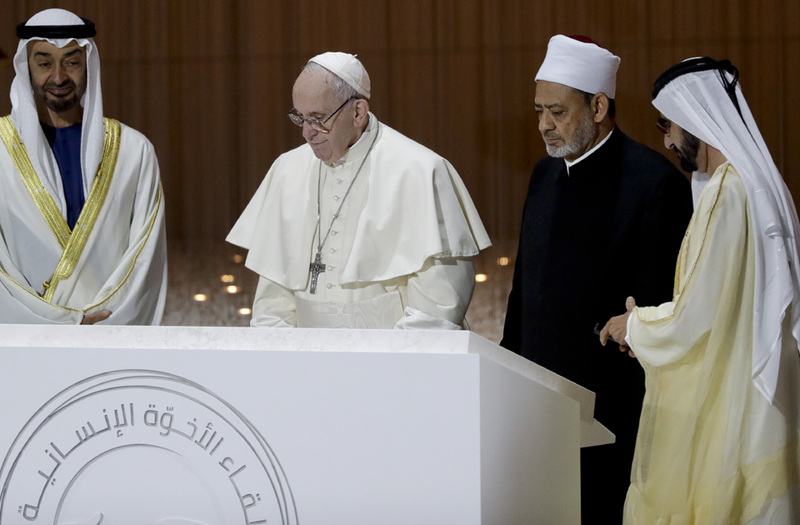 From left, Crown Prince Sheikh Mohammed bin Zayed, Pope Francis, Sheikh Ahmed el-Tayeb, the grand imam of Egypt's Al-Azhar and Sheikh Mohammed bin Rashid al Maktoum attend an Interreligious meeting at the Founder's Memorial in Abu Dhabi, United Arab Emirates, Monday, Feb. 4, 2019. 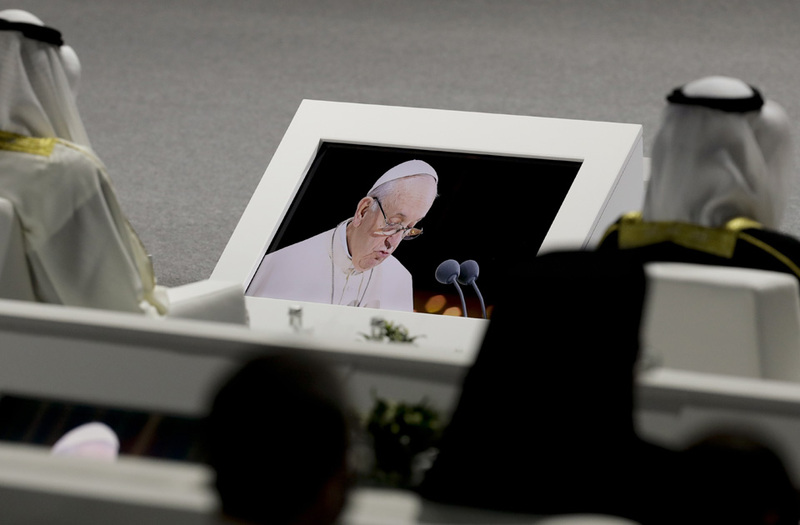 A monitor projects the image of Pope Francis speaking during an Interreligious meeting at the Founder's Memorial in Abu Dhabi, United Arab Emirates, Monday, Feb. 4, 2019. 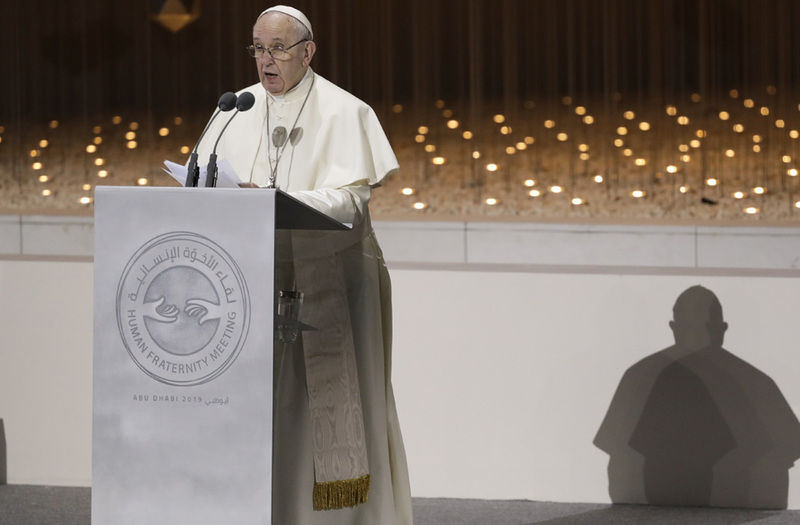 Pope Francis delivers his speech during an Interreligious meeting at the Founder's Memorial in Abu Dhabi, United Arab Emirates, Monday, Feb. 4, 2019. 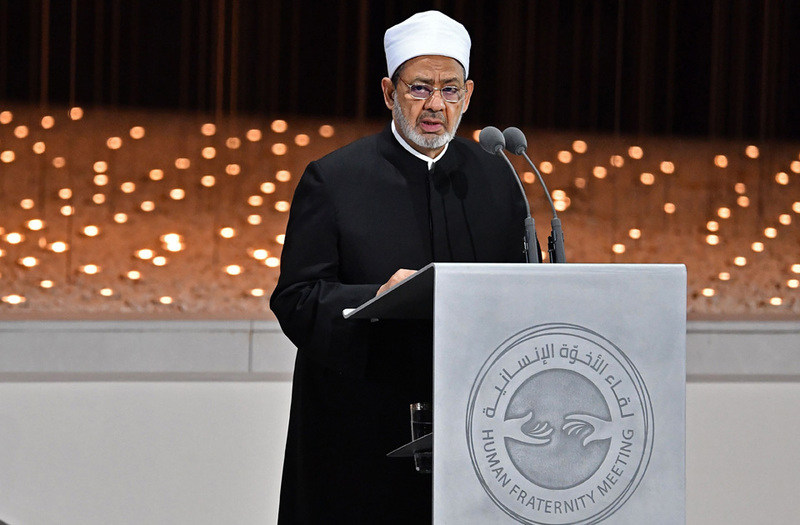 Egypt's Azhar Grand Imam Sheikh Ahmed al-Tayeb delivers a speech during the Founders Memorial event in Abu Dhabi on February 4, 2019. 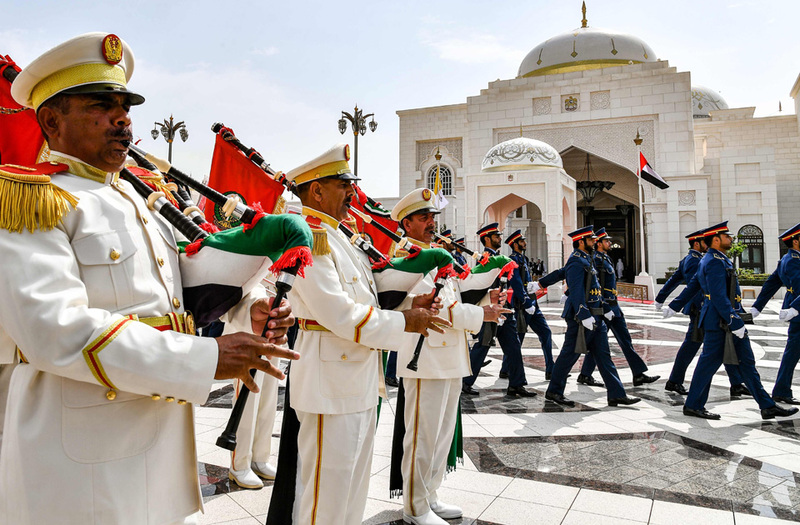 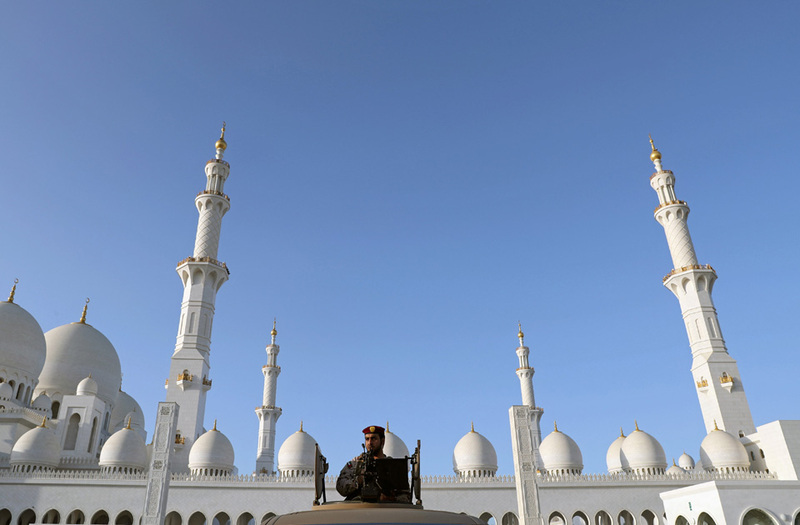 A member of the security forces guards during the arrival of Pope Francis at the Sheikh Zayed grand Mosque in Abu Dhabi, United Arab Emirates, February 4, 2019. 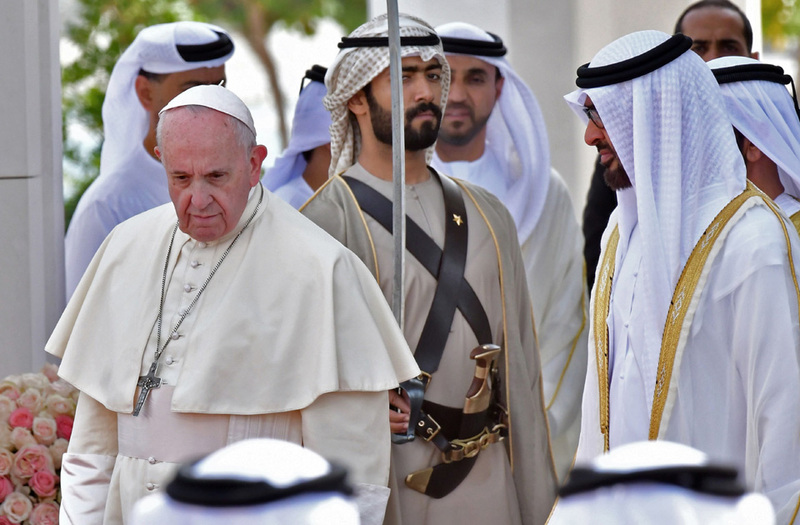 Pope Francis (L) is welcomed by Abu Dhabi's Crown Prince along with the Dubai ruler upon his arrival to the presidential palace in the UAE capital Abu Dhabi on February 4, 2019.